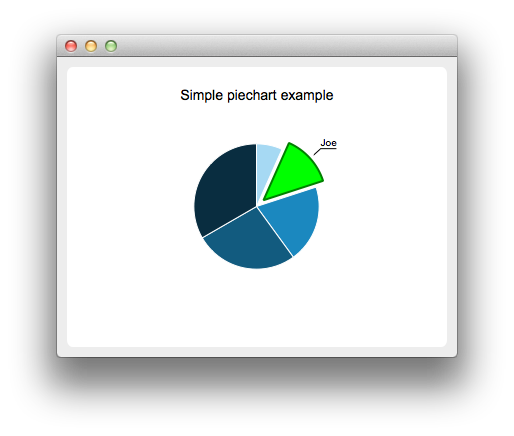 The QPieSeries class presents data in pie charts. A pie series consists of slices that are defined as QPieSlice objects. The slices can have any values as the QPieSeries object calculates the percentage of a slice compared with the sum of all slices in the series to determine the actual size of the slice in the chart. 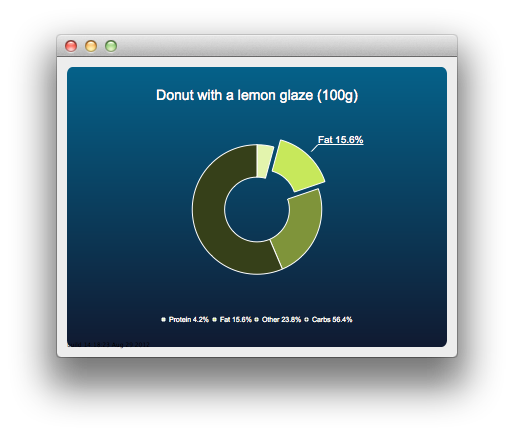 See the pie chart example or donut chart example to learn how to use QPieSeries. See also QPieSlice and QChart. This property holds the number of slices in the series. This property holds the ending angle of the pie. This property holds the donut hole size. This property holds the horizontal position of the pie. This property holds the pie size. This property holds the starting angle of the pie. This property holds the sum of all slices. This property holds the vertical position of the pie. Removes the pie series and its slices. Appends the slice specified by slice to the series. Slice ownership is passed to the series. Returns true if appending succeeds. Appends the array of slices specified by slices to the series. Slice ownership is passed to the series. Appends a single slice with the specified value and label to the series. Slice ownership is passed to the series. Returns null if value is NaN, Inf, or -Inf and adds nothing to the series. Clears all slices from the series. Returns the number of the slices in this series. This signal is emitted when the slice count changes. Inserts the slice specified by slice to the series before the slice at the position specified by index. Slice ownership is passed to the series. Returns true if inserting succeeds. Returns true if the series is empty. Returns the end angle of the pie. Note: Getter function for property endAngle. See also setPieEndAngle(), pieStartAngle(), and setPieStartAngle(). Removes a single slice, specified by slice, from the series and deletes it permanently. The pointer cannot be referenced after this call. Returns true if the removal succeeds. Sets the position of all the slice labels to position. Note: This function affects only the current slices in the series. If a new slice is added, the default label position is QPieSlice::LabelOutside. See also QPieSlice::labelPosition() and QPieSlice::setLabelPosition(). Sets the visibility of all slice labels to visible. Note: This function affects only the current slices in the series. If a new slice is added, the default label visibility is false. See also QPieSlice::isLabelVisible() and QPieSlice::setLabelVisible(). Sets the end angle of the pie. angle must be greater than the start angle. Note: Setter function for property endAngle. See also pieEndAngle(), pieStartAngle(), and setPieStartAngle(). Returns a list of slices that belong to this series. Returns the sum of all slice values in this series. Note: Getter function for property sum. See also QPieSlice::value(), QPieSlice::setValue(), and QPieSlice::percentage(). This signal is emitted when the sum of all slices changes. Note: Notifier signal for property sum. Takes a single slice, specified by slice, from the series. Does not delete the slice object. Note: The series remains the slice's parent object. You must set the parent object to take full ownership. Returns true if the take operation was successful. Appends the slice specified by slice to the series and returns a reference to the series. Slice ownership is passed to the series.